Dubai: UAE-based carrier Etihad has announced that it is strictly enforcing its cabin baggage policy during the summer holiday season, as it prepares to accommodate a surge in flyers over the coming busy period. In a travel notice issued on Monday, the airline advised passengers that given the significant increase in travellers during summer, which also coincides with the start of the school holidays, they will be making sure flyers adhere to baggage rules. “Staff will be checking the weight of cabin baggage at check-in at prior to boarding the aircraft,” the airline said. Summer is a particularly busy period for airlines operating in the Gulf Cooperation Council (GCC) region. In July last year, Abu Dhabi International Airport handled a total of 2.1 million passengers. The bulk of the passengers travelled to and from India, Pakistan, Egypt, United Kingdom and Germany. According to Etihad, economy class flyers are allowed to bring into the cabins only up to seven kilos of luggage, while business-class passengers can enjoy up to 12 kilos of weight allowance. The airline said the following baggage dimensions have to be strictly enforced – height: 50 centimetres, depth: 25 centimetres and width: 40 centimetres. Emirates airline hasn't issued any similar baggage alert, but economy-class passengers are allowed to take only one piece of carry-on that doesn't exceed seven kilos, while first and business-class flyers are permitted two pieces of carry-ons, each weighing seven kilos. Etihad said flyers would also do well to check into their flights well in advance, arrive at the airport at least three hours prior to departure, and observe proper check-in and boarding times for their respective flights to avoid delays. 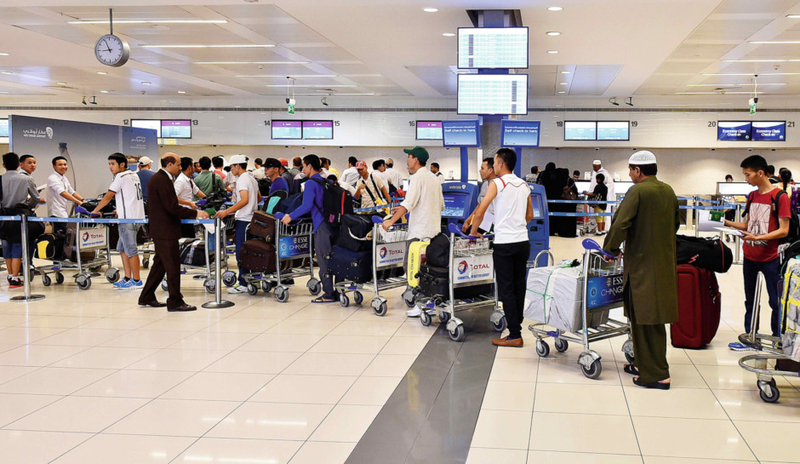 Those who live downtown can avail themselves of the airline’s early check-in service at the Abu Dhabi City Terminal at a cost of Dh30 per person. There is also a “moonlight check-in” facility which will cater to flyers between 4am and 6am and between 4pm and 6pm during the following periods: June 27 to July 9 and July 12 to July 14.